Cast a spellbinding glow with this Witching Hour Black Cat print lamp by artist Lisa Parker. Item Number: PT-B2182F6 | Approximate Size (Inches): 4.75 wide x 4.75 deep x 10.00 high | Approximate Shipping Weight: 1.50 lbs. 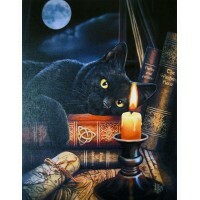 A magical black cat gazes into the candle flame in this beautiful art..